Mummy: Creating a mummy has never been so easy. Create sunken eyes with red, grey, brown and black eyeshadows. Give your face and body pale skin with a lighter foundation or body paint. Strapped on time and money? Simply create gauze by drawing it on your arms and legs. Shop the Melissa Midi Dress. Witch: Your witch will come together in no time. 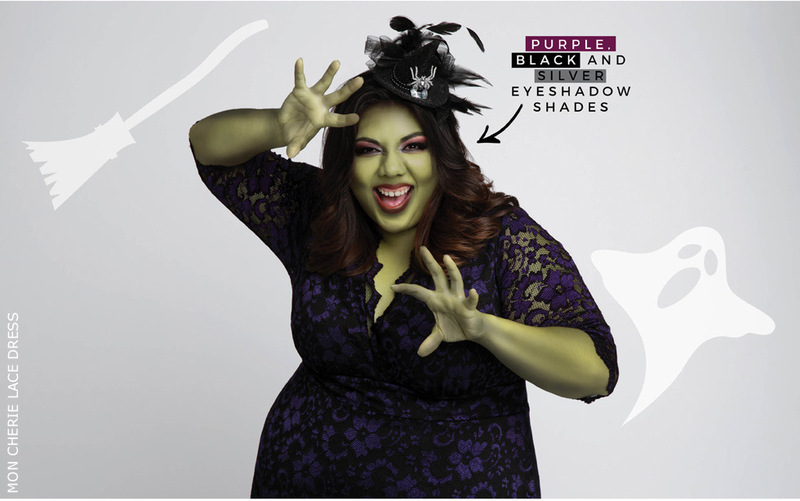 All you need is a witch’s hat (broom optional), makeup and body paint. Don’t have time to go green? Create a smoky eye with purple, black and silver eyeshadow shades. Shop the Mon Cherie Lace Dress. Angel: Putting a costume together has never been so heavenly. Simple pull a wedding dress out of your closet and add a halo (wings optional). Add a little sparkle with some glue on jewels for your face. Shop the Pretty in Lace Wedding Dress. 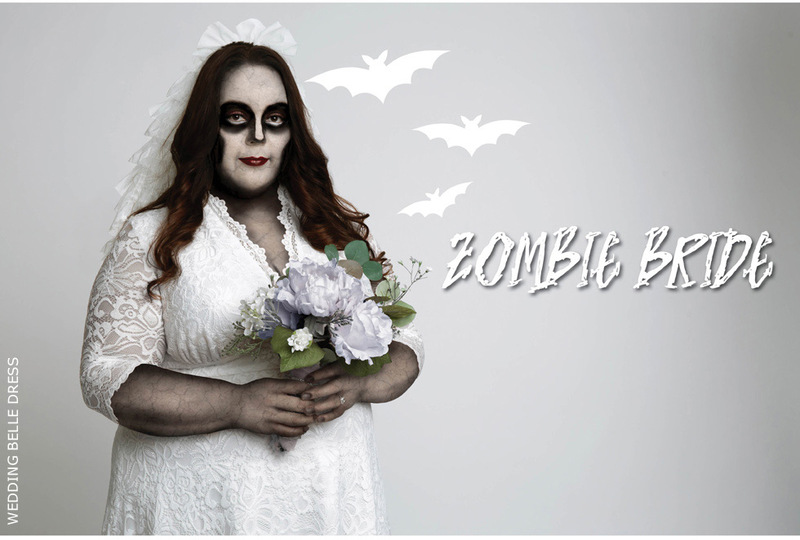 Zombie Bride: You’ll be an eerie bride by simply playing with some makeup. Create sunken eyes with black eyeliner and use white and grey body paint for a ghoulishly pale appearance. Shop the Wedding Belle Dress. Flapper: Grab some pearls, red lipstick, a fabulous headpiece, and a fake cigarette holder! Give your hair some short curls and you’ll be all set for your party! Shop the Livi Lace Dress. 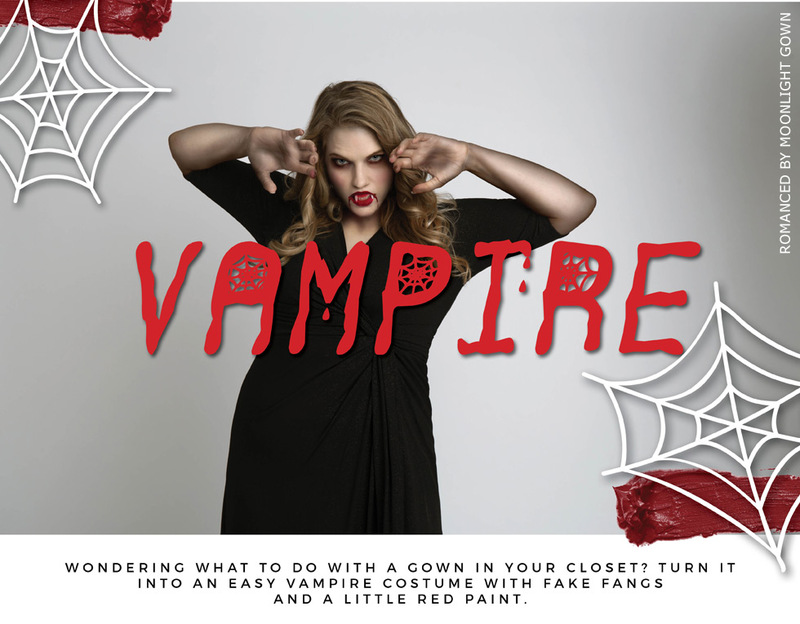 Vampire: Wondering what to do with a gown in your closet? Turn it into an easy vampire costume with fake fangs and a little red paint. Shop the Romanced by Moonlight Gown.